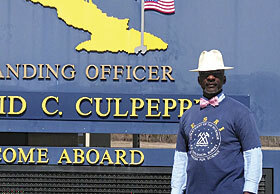 Dr. Lemuel Patterson, a STEM education instructional systems specialist for the South Carolina/Fort Stewart/DoDDS Cuba school district, poses at the welcome sign to Guantanamo Bay, Cuba, where students at the US Department of Defense Education Activity’s W.T. Sampson School conduct geocache activities on the island. 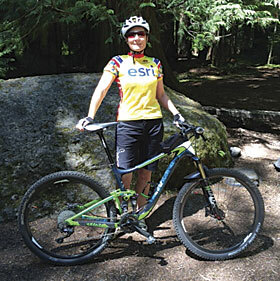 Gretchen Brown, CAD/GIS specialist for the City of Bainbridge Island in Washington State, dons an Esri cycling jersey while mountain biking on the Lower Big Quilcene Trail in the Olympic National Forest. 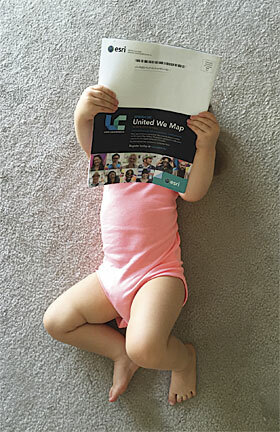 Annabelle Henderson, daughter of FBI geospatial analyst Parrish Henderson, kicks back to read the latest issue of ArcUser at the family's home in Miami, Florida. "Apparently, now we have two geogeeks in the house," said Henderson's wife.